Church Stile Campsite nestles in a traditional lakeland oak woodland setting with stunning views to the Screes Mountain Range. Our Holiday Caravans are available for weekly hire or for short breaks at prices to suit all budgets. With your own caravan holiday home at our holiday park you can enjoy a great new lifestyle. Holiday whenever you want - Getaway for a weekend away, or stay for most of the season. Church Stile Farm & Holiday Park is fully equipped with all the modern amenities you expect to find at a stylish camping ground. Wasdale is one of the big mountain valleys of the Lake District with stunning scenery, making it a wonderful backdrop for your holiday. Situated in the heart of Wasdale, arguably Cumbria’s most majestic valley, Church Stile Holiday Park and Campsite offers visitors the most spectacular location from which to explore and enjoy the Lake District. 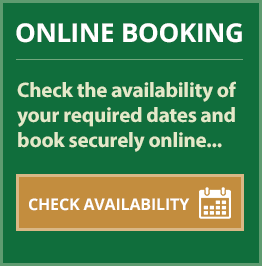 We offer a diverse range of family friendly options for your stay including camping pitches, electric hook-ups, hardstanding pitches for motorhomes and campervans, static caravans to rent, static caravans to buy, or why not try ‘glamping’ and stay in one of our traditional Shepherd’s Huts combining luxury camping with an age-old custom. Nestling in an idyllic oak woodland setting on a traditional Lakeland sheep farm, the area is a haven for wildlife with stunning views to the mountains. Yet the pretty village of Nether Wasdale with its 2 wonderful country inns serving hearty meals and fine ales, is only a two minute stroll away. Wasdale is home to England’s deepest lake, highest mountain and smallest church and yet the wonderful beaches on Cumbria’s coastline are only a few miles distant. Whether you wish to simply enjoy the peace and tranquillity of this unspoilt valley or take advantage of the many opportunities for walking, climbing, cycling and kayaking or visit some of West Cumbria’s many attractions, Church Stile is your perfect location. 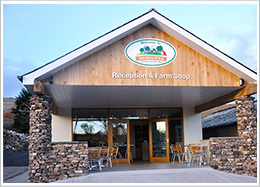 2015 saw the opening of a farm shop/reception building at Church Stile. 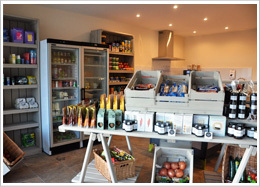 This handy little shop is stocked with everyday essentials such as bread, baked beans, local milk and eggs to items you may have forgotten such as tin openers, toothbrushes and tent pegs. There is a small range of camping gear (walking poles, camping gas, chairs, socks, etc). We also stock some local produce such as delicious jams and chutneys from Hawkshead Relish and Claire's Handmade; Appleby Creamery cheeses; Woodall's Bacon and Sausages; Silver & Green's Olives; not to mention Mawson's Ice Cream which is a well deserved treat after a long walk on the fells. The cafe serves breakfast rolls from 8am using Woodall's produce and local free-range eggs (vegetarian breakfast rolls are available on request). There is also homemade soup and freshly made sandwiches as well as packed lunches (adult and kid's versions). Church Stile Campsite nestles in a traditional Lakeland oak woodland setting with stunning views to the Screes Mountain Range. Covering about 7 acres in total the campsite provides a large level camping ground for pitches for up to 85 tents. Our Holiday Caravans are available for weekely hire or for short breaks at prices to suit all budgets. Come and experience home from home comforts in our fully equipped caravans in one of the most beautiful areas of the country. Our Shepherd’s Huts reflect the style of a 19th century Victorian hut. They provide a wonderful alternative to camping in a tent. Romantic and cosy, Shepherd’s Huts are the perfect place to snuggle up after a day enjoying the fresh Cumbrian air. Church Stile Farm & Holiday Park is fully equipped with all the modern amenities you expect to find at a stylish camping ground. Including a children's play area with swings and climbing frames, picnic tables, washroom facilities.